Are you currently looking for a modular office, wall partition, guardhouse, or inplant building for your warehouse or building? Shelf Master offers a wide variety of modular office types and configurations to meet your demand. With our practical modular office solutions you can double or triple your usable floor space. This is the ideal solution when you are trying to increase storage space, increase production and minimize down time. 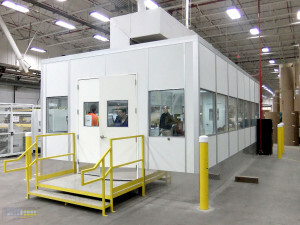 Two Story modular office buildings utilize that unused airspace in your warehouse. When you’re looking for a rugged, industrial, in plant office for your warehouse operations, choose the product that endures the test of time. 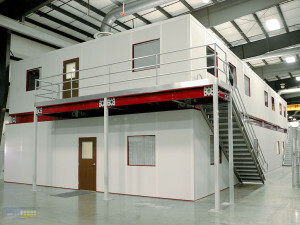 Shelf Masters offers a wide variety of in-plant modular two story offices. Lunch rooms can be made of fiberglass walls to tolerate dents and scuffs. We supply dedicated circuits for microwaves and vending machines. We can also provide counter tops and tile floors as required. 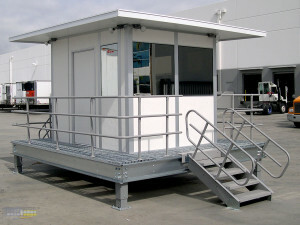 Guard houses and service booths can be delivered completely assembled on a fork-lift-able base or shipped disassembled. Both are available with solid or sliding windows, sliding glass or standard doors, and equipped with all the electrical accessories required.